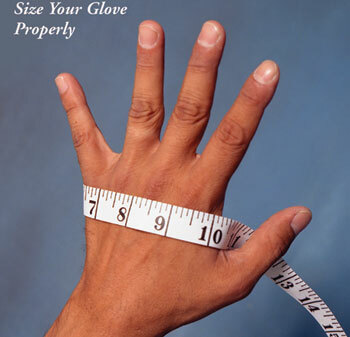 How to measure your glove size. Use tape measure to find the circumference of your hand around the palm area. This measurement, in inches, is closest to your actual gloves size. For example, 7” is equal to a size 7 glove. Sizes may vary, if your size is between 7 and 8 go low, Ergotech gloves should fit snuggly. For easy size comparison, refer to size chart below. Since Sorbothane does not absorb moisture, hand wash using mild detergent and luke warm water. Hang to dry. DO NOT MACHINE WASH ON HEAVY CYCLE. DO NOT USE DRYER. NOTE: To repair leather softness, once dry, apply a good quality leather conditioner to replace oils lost from washing. Copyright © Ergotech Protective Devices Inc.